It's been a long time since I've posted anything substantive to this blog, so it's rather ironic that I've actually been nominated for an award for it. Nonetheless, I have by the fabulous Beth and Gayl of Sessions- Studio Time fame. 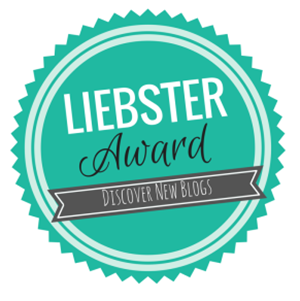 The Liebster Award is given by bloggers to bloggers, to promote the blogging sites we love and support and so it is my honor to accept this nomination. 3. Nominate 5-11 bloggers whom you feel deserve this award and have fewer than or equal to 3,000 followers. 4. Answer 11 questions posted by the nominator, and ask your nominees 11 questions. Now that steps one and two are complete lets get to my nominations. It’s been awhile since I’ve read these stories so some writers may no longer be updating but they deserve these nominations so I had to nominate them no matter what. Veron Asher for After the Calling. I know Veron and this story are long gone but I’ll close my eyes tight and wish that somehow it’s possible to have my questions answered about that marvelous story that definitely would have deserved this nomination. 1. Do you have characters you really dislike? Did you start out disliking them? I don’t have any characters that I dislike. I love them all. I guess I would say there are some that frustrate me because they like to hide and not show themselves and the winner of that award would be Isabella Monacco. 2. Do you plot your stories or just let them happen? I start out trying to plot but I also allow for things to happen. I’ll have a 3am idea that can takeover where I wanted to go and drive the story in a different direction. 3. How do you deal with writer's block if you experience it? I suppose I’ll know once I get out of the block I’m currently in. I feel like I’ve painted myself into a corner I can’t get out of and have been stuck for about 2 years now (that coupled with RL stuff). 4. If you've ever tried writing with someone, how did it work out? I tried a long time ago to write with someone and it didn’t turn out well. We actually stopped being friends partially because of it. I think that was just a fluke and not particularly indicative of writing partnerships in general. 5. Do you use fantasy objects like the weather controller in your sims stories and if so, how? You know, I’d planned to use it but the story so far has never called for that particular object, though it definitely would for two “episodes” that were to come. I’ve never had a need (or thought of a way) to use those kind of objects, but it’s certainly an interesting idea. 6. Has a character changed on you? If so, how do you handle it? Uh…yeah. His name is Nico DeSantos. He was supposed to be a background character in the beginning and has commandeered my story to epic proportions. I don’t think I’ve handled that well because he is a part of my writer’s block. I’ll say Isabella changed on me as well since she was a very different character when I first had the idea for this story. Again, she’s part of the block because she disappears on me. 7. Do you tend to get lost in building the world and let the story lapse? If so, how do you deal with it, or is that a feature and not a bug? I’d say for the last year I’ve done just that. I’ve been procrastinating by “needing” to completely redo my story hood and all the sims. That started a long process of combing through downloads, going on exhaustive download hunts for no real reason, and now, finally, remaking all of my sims and making new townies, etc. Clearly I haven’t been dealing with it well, lol. I think it’s safe to say that for me this is definitely a bug. 8. How do you deal with posing? I used to try and make intricate and complicated poses when I was posting regularly. I think if I start again I would make things much simpler, not try to collect all the poseboxes (my “posebox project” was another procrastination technique) and not feel that I have to use 10 of them in each episode. I’m developing a more minimalist mind; less is more. 9. Do you process your shots in Photoshop or a similar graphics program? I use old Photoshop (CS3). Nothing fancy, just basic layers work. 10. How long does it take to write and post a chapter? The shortest time it took was about a week and the current chapter that I have yet to post is going on two and a half years now and that’s just the writing. I would say the average has been about 3 weeks give or take. 11. If you had to spend an afternoon doing the most boring thing you can imagine, which of your characters would you force to spend it with you. I would definitely take Sloane. She would make it a fun experience with her wise cracks. How do you come up with your character’s names? Do they hold a special meaning to you? Are they names of people you know? Are any parts of your story autobiographical in some way or based on any part of your real life or the lives of people you know? If so, which parts? Which came first; the Sims characters or the story? Do you shoot your story shots in your playable hood on actual lots or do you have “sets” that you create (just boxes with decorated interiors)? What things, places, people inspire your writing/your story? Do you ever think of an alternate universe for your characters? Who would they be there and what would their lives look like? How many characters is too many for you to work with at a time/ in one story? Do you have too many now or do you want more? Do your characters (or the idea of them) follow you around (i.e. : If they weren’t in this story would they be in a different one that you create)? If you weren’t writing what would your creative outlet be? Do you have ones other than writing now? If you are still creating your story, how much further do you think it will go? If you have stopped writing do you think you will ever continue? Which one of your characters would you trust to save you in a life threatening situation? Which one would let you die? I'm so glad you responded to this! I miss your world, and I'm with you on number 11 - Sloane would be entertaining. I really like all your questions, too. If you don't mind, I think I'm going to play around with some of them. They're interesting. I miss those story blogs, too. Also Mao's Wings of Steel, ASK's Worlds Apart, and so many beautifully illustrated and written works. I hope you'll pick up LLL as well. Thank you for all your support, and please keep going! Thanks Beth. I would love to see your answers to these questions. I miss Wings of Steel too. It just seems like all the Sims 2 stories that I used to read just up and vanished one day, but a lot of them had been around long before I started reading them. Thank you again for reading and enjoying my story and for the nomination. Oh, I agree with you so much on the posing thing! Amazing images can be made with poses, but it can also become such a burden, which is always the kiss of death for any "for fun" writing project. And I can totally relate to the random 3am story ideas that change every plan you ever had for a story. Usually for the better, though!